BARGAIN DECORATING WITH LAURIE: PROUD TO BE AN AMERICAN! I'm joining Mary at LITTLE RED HOUSE for Mosaic Monday. I obviously don't use the same program all of these other bloggers use to make beautiful mosaics (that's my story, and I'm sticking to it! ), because mine don't turn out pretty like theirs. 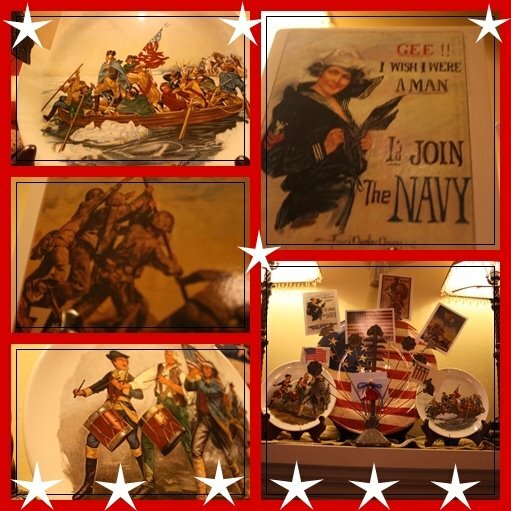 I have combined a few pictures from my Memorial Day decor, and I hope they will qualify as mosaics. Memorial Day is an appropriate day for me to talk about Terry's blog, since the name of her blog is LADY LIBERTY. 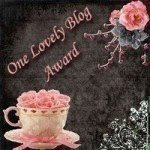 Terry has presented me with the One Lovely Blog Award, and I am so honored. If you haven't been to her blog, be sure to check it out. She always has the neatest pictures, and she posts them with great poems that seem to be written to go along with the picture she posts. I love to go see what she has come up with each day. Terry, I am so honored that you thought of me when you passed this award along. I must apologize, because I always break the rules when it comes to awards. I am supposed to pass this award to 15 other bloggers. Sadly, I am greedy enough to accept an award, but I can never decide to whom to pass an award. 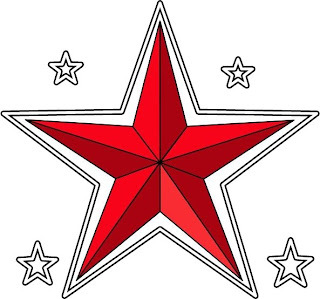 I'd like for my readers to take this award to their blog if I've visited your blog more than once, because I might visit a blog once, but I only go back for another visit if it's a lovely blog. As we celebrate Memorial Day, we remember those who have given their lives for our freedom and those who have fought and are fighting for our freedom. Don't forget to stop by Mary's beautiful blog, LITTLE RED HOUSE to get links to all of the pretty mosaics. Mary, thank you for sponsoring this fun event. Well I'm up and can't sleep...so I decided to come by for a visit! What??? Tiptoe??? You mean I can't wake you to get up and have a cup of coffee and chat at 4am??? Hehe! Ohh my, I see that our dear friend Cindy isn't sleeping either! Shhheeeshhh...midlife hormones!!! Well Darlin'...I just love all of your pretty mosaics in honor of Memorial Day!!! I really like yours because you've been able to add the stars, etc....so pretty! I have yet to figure out the mosaic thing! I need to get my hiney in gear! Hehe! Wonderful! And very patriotic for today. Have a great one. I enjoyed your post today. It was a great tribute to honor our brave military. Different is always better. Wow. You've been busy decorating. I've always thought you did a great job editing pictures, adding graphics and such. What program do you use? Laurie-your mosaics are wonderful! I have no clue how to make one, which makes me appreciate yours that much more. How beautifully done! Your mosaic is just perfect for such a special day. Love your pictures! Congratulations on your award! Have a lovely day! Beautiful! I love all of it, Laurie! What a great mosaic! Everything you do is always so creative and imaginative...why would this be any different?!!! I love all of your mosaics...GORGEOUS!!! 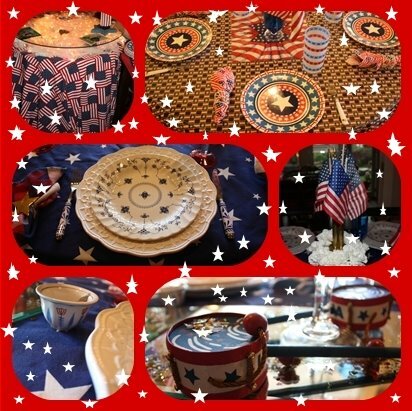 The patriotic theme is soo beautiful...and you put all of the photos together so well!!! I LOVE IT!!! 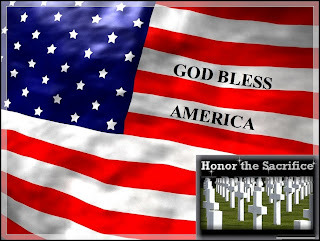 Have a wonderful Memorial Day!!! I wanted to come back and thank you for praying for sweet little Connor!!! When I popped onto your blog and saw his name at the top of your prayer list...I completely came unglued!!! You are the sweetest thing to do this!!! There are no words to explain how much this means to me!!! Thank you...thank you...thank you!!! Your kindness is overwhelming and I am sooo grateful!!! I know that his family will join me in thanking you again and again!!! Have a wonderful day and God bless you Laurie!!! Lovely..thank you for those very appropriate mosaics for Memorial Day..They are great! Laurie, What a great job you did with the pictures. I love the collage one-- we forget some things. I always look forward to the program on PBS Memorial Day and the 4th of July. This one always had me in tears, but the next is quite upbeat.Reality ! Hello Laurie...I loved your mosaic post! You have some really nice things to commemorate Memorial Day. I always enjoy reading your post...makes my day! Have a great Day! P.S. For some reason my thumbnail picture is not appearing on blogs...under followers..so don't laugh if you see a big red "X" by my name. I can't figure it out! LOL! I LOVE your patriotic mosaics!! VERY CREATIVE! Hope your holiday is going well! beautiful pictures and what decor in your home. I put out a few things here and there because we are not normally home but at our trailer. Do you leave your Memorial Day stuff up till 4th of July.... I think I might! It is lovely! congrats on another wonderful award.doesn't it just make your day?and week?and month?ha. lovely memorail decor.i too am surprised you have so much ...well knowing you,i guess not really.love ya. What a wonderful and inspiring post Laurie. Your mosaics are very beautifully done and pretty. Have a blessed evening my friend. I LOVED your post.......great job. Goodness - gracious - I do not have any idea how to make a mosaic and your Memorial Day mosaics are fabulous. Yours are especially pretty because you know how to add extras like the stars. I love all the patriotic pictures. It makes us stop and remember. 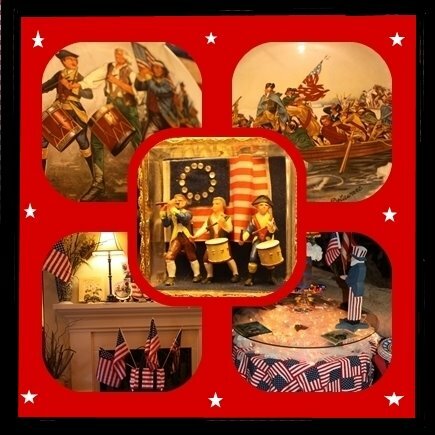 Hello Laurie, your mosaics are beautiful, patriotic and perfect for memorial day, I hope you had a wonderful memorial weekend with your family, Kathy. Lovely!!! I like how you did your mosaics; very creative! Oh, and thank you for your nice comments on the patio and Chase's recital, he thanks you too! Great post and outstanding mosaic. I think you did the best and I did the worst. lol I'll have to practice a bit. Thanks for stopping in my blog as always! And I can relate, my Dad is a Korean and Vietnam vet. He did 20 years active, 10 years reserves in US Airforce. I was in second grade when he went to Vietnam. Then he put in 20 years with the state corrections dept. here and even helped guard our dams on the rivers after 911 happened. So he has more than done his duty!! Love your collage posts and all, you are one step ahead of me on learning to do those! Love all the red white and blue and the lovely sentiment for this important day! God Bless!Tell your husband I said Thank You for his service!! I have tried off and on to reach the comment section of your blog and I could not get in....why I don't know. I have tried since your darling post of your road trip for american idol from arkansas....that was so very creative and then your toile post was beautiful and hysterical...I love every post. CONGRATS ON YOUR LOVELY BLOG AWARD---you deserve it and Terry who gave it is a beautiful lady. thank you for visiting me and the prayers for AMY and her friend Leila. Wow, you have the prettiest mosaics ever! What a great tribute to honor the veterans this weekend. Your mosaics are just lovely. I love the one with the dishes, of course! Your mosaics are beautiful, but of course, they would be! You always decorate so nicely and have the most unusual items...I love to see it! Hope your day was blessed and fun! Have a wonderful week!! Fabulous, Laurie!! God Bless the USA!! Bravo! Bravo...and yes I shout this one...BRAVO !!!! Filled with ooos and ahhs~!!!! HI Laurie! I love your patriotic mosaics! You've done a wonderful job! Hope your Memorial Day weekend was a good one! Thanks for visiting my blog ! I almost couldn't get into your blog...but kept trying..darn blogspot...anyway , hope I love your mosaic and I really love red,white and blue. I decorated my bedroom in these colors and have a gorgeous quilt (not quite done) in the colors of our great country ! Well....I think your mosaics turned out lovely. I hope you and yours had a beautiful weekend. Your mosaics are really lovely and so appropriate for Memorial Day. I can't imagine you could put that together so nicely...well I can imagine YOU could but you know what I mean..*s*. Congratulations on your award too. You deserve it! Hope you are having lovely weather your way...and the day is sunny and bright! I don't know what YOU are using to get these spectacular results, but it's definitely the best photo mosaic program out there. Yours are colorful, creative and fun! Glad you enjoyed my rambling about my Dad ... I was so young when he died and it was very sudden - one day he was with us, got sick, and two days later he was gone. Closure really wasn't an option for one so young and vulnerable. I've taken a part time job .. assisting a real estate agent in town who is specializing in 'short sales' ... lots of support tasks for me to do and I'm learning about an industry I knew very little about. Time is more precious than ever!!! Laurie: I LOVE your mosaics! They are beautiful! I have not EVEN learned how to do that yet...I am so challenged! Your blog is fabulous and I enjoy it so much!! So well deserved...our men and women who give up so much for the rest of us. All thanks are apprecitated! Hello, I think your mosaics are just beautiful! I loved reading your post. I hope you have a wonderful day.